Important: If you haven’t gotten and verified an email from ICANN confirming your domain, login into umw.domains and there should be a message asking you to resend the email for confirmation—if there isn;t you did it already. Do that ASAP or else your domain will be suspended. Watch this 4 minute video by Kurt Vonnegut on the shapes of stories. What is the “digital” in Digital Storytelling? For this week read and reflect in a blog post on Bryan Alexander‘s “Web 2.0 Storytelling” chapter from his book The New Digital Storytelling. Also, based on Alexander’s discussion of digital storytelling, explain if the tumblr bot site Scenes from The Wire and Facebook’s TheWire constitute digital storytelling? Explain your rationale in your reflection to Alexander’s chapter, and tag the post “web20story” (no quotes). This week we will be watching episode 13 of Season 1, and episodes 1 and 2 of Season 2 of The Wire. 3 Daily Creates: This week you all went to town with the Daily Creates, we were deeply impressed. Keep it up this week. Get into the daily habit of creating. Remember, if you spent 10 minutes on the Daily Create, you spent too long. That said, if you are inspired go with it. You can choose from any 3 TDCs during the week, but you have to do it on the day it comes out. Doing all 3 on Sunday will not be accepted for credit. Also, your Daily Creates shouldn’t be old photos, writings, videos, or audio you created previously, unless you add something significant to it that effectively makes it new. 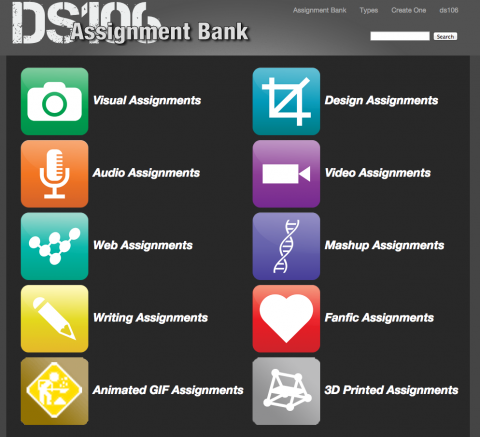 Exploring the Assignment Bank: You need to do three assignments from the ds106 assignment bank from three different categories of your choice, i.e., visual, design, audio, etc. that need to reflect each of the 3 episodes of The Wire we watch this week. Make sure your completed assignments show up in the assignment bank by using the proper two tags, for example, VisualAssignments, VisualAssignments5694. Also, it’s your job to narrate the process, explain your thinking, and tell the story of your creation. To wit, Alan Levine‘s awesome resources for writing up ds106 assignments is required reading for this week before writing up assignments. You need to set up a framework on your blog to organize all of the work you will do in the coming weeks. By creating and using categories as your start, by the end of ds106 your blog is going to be like a well-oiled machine of creativity. Here is a suggested structure, but feel free to come up with your own. You may end up with a category structure like this example. Once you have created these categories, you will need to create an an organized menu to reflect the framework. Find out more about creating and customizing menus in WordPress here. Commenting: Did I mention commenting is the life’s blood of this class? Read widely and comment freely. And this is not limited to blog comments, this can happen on Twitter, Flickr, SoundCloud YouTube, etc. And remember to link to all the comments you left over the course of any given week in the Weekly Summary post. You can find all the course posts on our ds016/wire106 page. Moderating Comments and Jetpack: Some folks still haven’t moderated comments other have left on their site. Also, a number of you still haven’t installed Jetpack. How do we know this? Because if you had we would be able to subscribe to your blog and get all your posts via email. Take care of this. Twitter: At this point in the semester you will have realized Twitter is essential to your active engagement and regular feedback in this course. If you are not there, you are missing much of the community emerging around wire106. Given this, it will be difficult for you to get the full experience, an by extension full credit. Once again, follow the hashtags #ds106 and/or #wire106 and try using Tweetdeck for searching on these specific hashtags it there own columns. Known: We setup Known last week, but now it is time to start kicking the tires on this application. The value of Known is it integrates your various social media in one place that you push out to those sites. From here on out, you will need to post the links to your assignments. Daily Creates, and weekly summaries to through Known to Twitter/Flickr/SoundCloud, etc. Get in the habit of using this space to share stuff you want the rest of the class to see on the hub.wire106.com. Also, share you thoughts about Known, and speak freely, this is an experimental application we are testing out this semester. Wire 106 Lunch (sign-up): Also, the Wire 106 lunch will continue this week for interested students. We’ll be getting Pizza off-campus at Brothers this week, we’ll get lunch to talk ds106, The Wire, storytelling, and more. This is optional, and we can find other options for those of you who can’t make it. Consider it a free lunch. Sign-up for this Thursday or Friday. 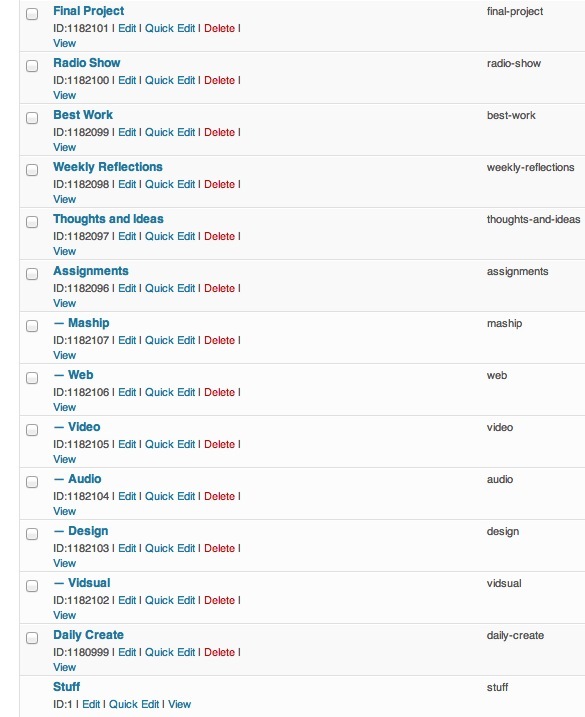 This entry was posted in digital storytelling and tagged ds106, weekly summary, wire106. Bookmark the permalink.